Dutch truckers make their point with a low key motorway go-slo this morning. Parking is surreal at the Estonian National Opera. Brittany Ferries’ cheap ferry to Spain finally makes its debut. It’s been quite quiet at the Gibraltar border, Irish truckers want exemptions from the new HGV Levy, and Spain blots its copybook after last week’s stellar road safety results. Concerns over salaries and ‘social dumping’. Dutch truckers held a go-slow motorway protest this morning. Protesters assembled at five sites around the country at 09:00BST – at Beverwijk near Amsterdam, Nunspeet near Zwolle, Rotterdam, Arnhem and Gilze near Tilburg – and rallied in Utrecht at 13:00BST. As of 10:00BST there were signs of slow moving columns of traffic heading towards Utrecht but no major disruption. (update 12:00BST: reports say up to 400 drivers took part in the protest driving at no more than 60kmh towards Utrecht in columns of cars and trucks, accompanied by police. The rally began at 11:30BST, after which the trucks dispersed). Protestors’ precise plans were only made public at the last minute though notice was given at the end of last week. Upset at the collapse of collective-bargaining wage negotiations last month, and concerned about ‘social dumping’ where firms use cheap labour from Eastern Europe, the protest follows a similar demonstration last month. Protesters have promised a ‘warm spring and hot summer’ unless their demands are met. Logistics is a major industry in the Netherlands. The country of just 16.8m people accounts for 14% of international road transport in the EU. Random: the car park gates of the Estonian National Opera in Tallinn. 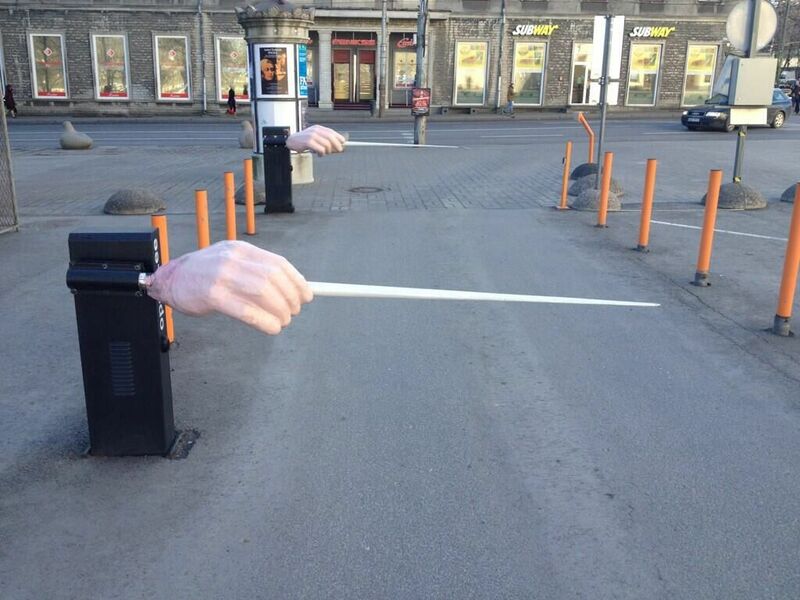 Pic from @HLintu, Hannu Lintu, Chief Conductor of the Finnish Radio Symphony Orchestra (via @Nordic_News). roundup: UK-SPAIN FERRY. After a false start last weekend, the Brittany Ferries economie service from Portsmouth-Santander finally departed for the first time on Saturday. The first review has also been posted after the BF Enthusiasts Club crossed Portsmouth-Le Havre on the economie ship, Etretat. It seems pretty much as expected: nothing horrendous, but you get what you pay for. GIBRALTAR QUEUE WATCH: longest queues over the weekend, 1h45 Saturday lunchtime, two hours late Sunday evening. HGV LEVY. Irish hauliers are calling for exemptions from the new HGV Levy on the A5/N2 which crosses Northern Ireland from the north west Republic, and which the Irish govt is paying to upgrade. SPAIN. Despite well above average road safety stats published last week, it was a bloody weekend on the roads with a reported twenty fatalities.